Confessions of an ADD English Teacher: Do those homemade cleaning products REALLY work? This is part 1 in a series I'm doing testing natural cleaning ideas. If you've followed any cleaning boards on Pinterest, you've seen the pins for homemade cleaners of all kinds. I went crazy and decided to try some of the ideas to see if they really work. . . Because there isn't any Snopes for Pinterest, and there really ought to be. Back in January, I tried the homemade laundry soap and ....it works! When it came to the homemade dishwasher soap...It was a mixed bag. Yes, it works...but so does the $1 a box stuff from the dollar store. And it does about the same number of loads. Oh, and if you can't get bulk citric acid and have to rely on the lemon Kool Aid...it costs the same as just running to the dollar store. Now, lets get to the meat and potatoes of cleaning...or rather the vinegar and baking soda. People who make their own cleaners. The big question is...does it work? Will Vinegar and baking soda really clean just about anything? In order to give this a proper test, I had to let my stove get dirty. It wasn't hard. 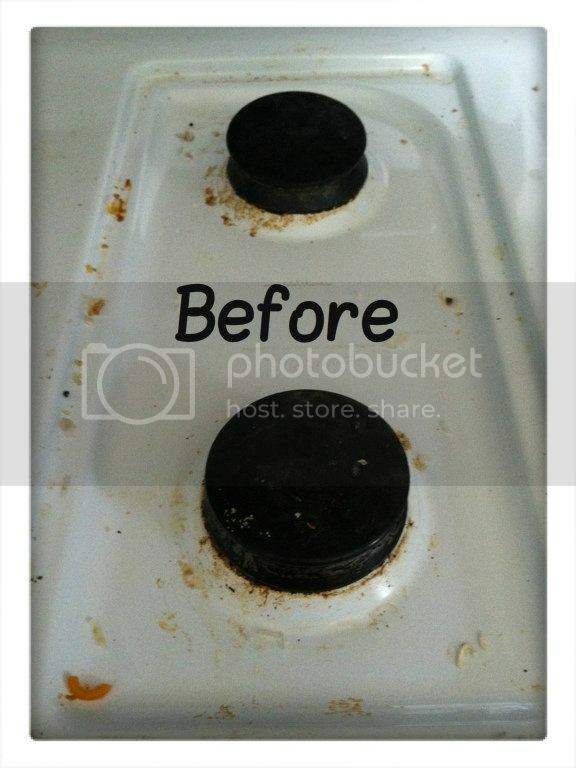 I took one for the team and...didn't clean my stove for several days. 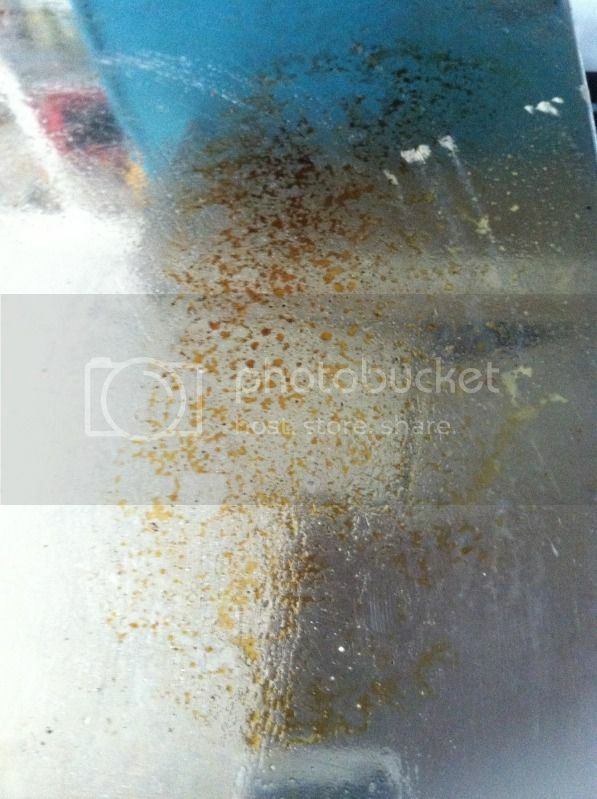 The first step to cleaning the cooked on greasy grime is to sprinkle it with baking soda. Next, wet a cloth and rub the baking soda into the grime. Then, wipe up the baking soda. And...it doesn't just work on stoves. You know how pans get grease residue that builds up? It takes that off, too! With a little baking it soda it was sparkling clean! you totally wanted a picture of my ceiling, didn't you? Next ... on to vinegar! And if you're stopping by from one of the link parties that featured this blog post, and have an awesome project if your own to share, please do so at the link party I Co-Host every Thursday! Pin Inspiration Thursday! I love that you tried it and it works. I will have to try that too :) since I now know it works :) Thank you for sharing at The "Sunday Stop"!!! Love this. I've been testing the natural cleaning products for a while now. Some work wonders, others (dishwashing soap) are duds. I've also just tested a bird house from a 2 liter bottle pin. All sorts of wrong, but fixable. I'm going to blog that someday. There is a blog where a woman tests them with some humor... though some she fails on purpose I think. Interesting article. I've been considering making my own more natural cleaning supplies. Glad you did the test, so I can move forward. Hey Micki! It was great meeting you Saturday. I'd love to learn some couponing from you sometime. Take care! I'm definitely going to try this! Thanks for sharing! Oh my! That is amazing! And what a way to pinch pennies! I'm gonna try this! I love cleaning with baking soda too. Your vinegar tip is great too. I wonder if I can substitute lemon grass for lemon balm, since I have some on hand? Great post! I learned so much, I showed you off tonight at my party! Great post!! I love natural cleaners!! I have even started making my own stain spray works awesome!! Kadie, I would love the recipe for the stain spray. Can you give it to me/us? Snopes for Pinterest -- that is SUCH a great idea! I'm going to have to try the baking soda on my own stove. 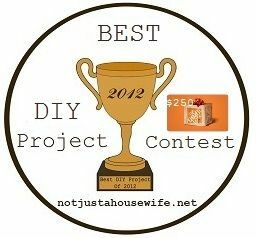 I'm at 50% success on pinterest projects and think you are on to something with Snopes for Pinterest! And using soda for scrubbing grime! Thanks so much for sharing on Busy Monday! 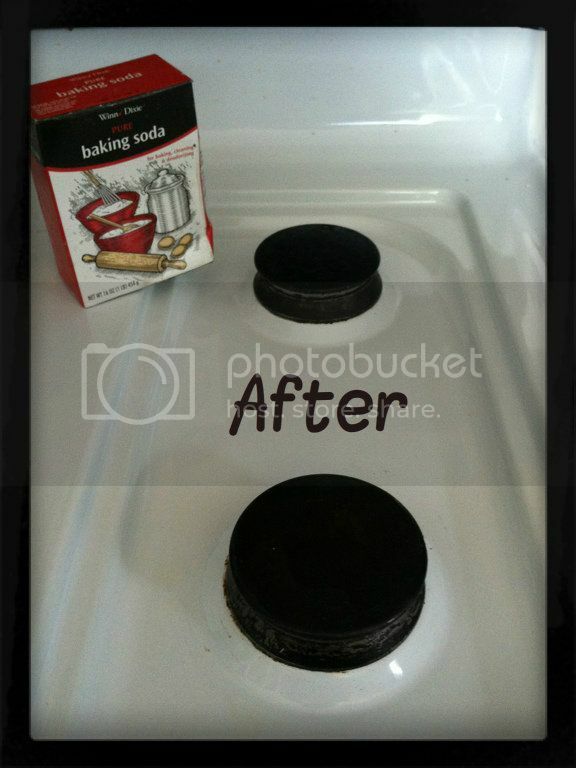 Baking soda and vinegar are my secret tools for cleaning. I learned about them from my mother-in-law and she swore by them until I had to try it by myself. Awesome post! Thanks so much for sharing at Mom On Timeout! 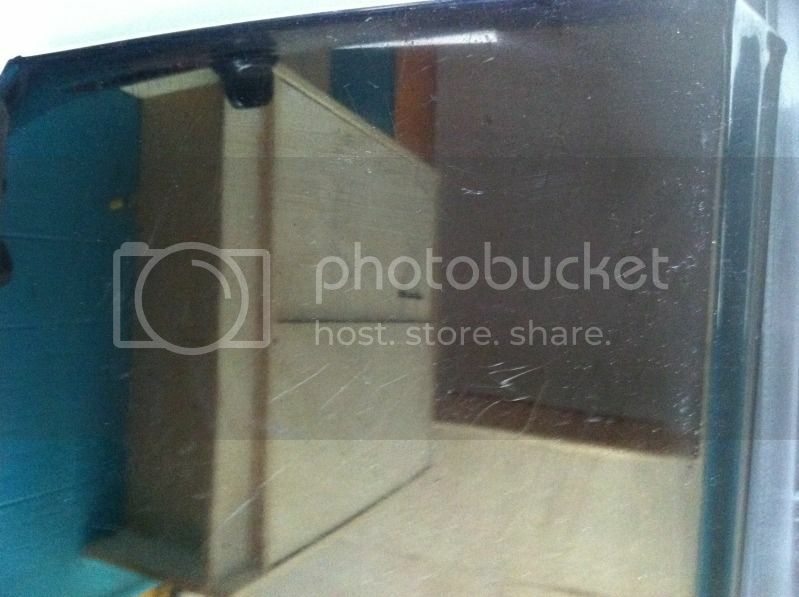 I have used a mixture of vinegar and water for my mirrors and windows for years. I tried vinegar and Dawn dish soap for a shower scrub. It worked OK--not much better than store-bought spray, but the worst part was the smell that has been lingering for 4 days, no matter how many fans, air fresheners, etc. The vinegar odor turned into an even more foul smell! Don't try that one! I liked your blog. I made the laundry detergent also. Loved it at first, especially the price. But then I started noticing a smell while wearing the clothes. It is a gross smell that you can smell on people that don't wash their laundry very often. I am thinking of just adding it to my Tide and see if I can come up with a way to stretch it a bit. Some savings is better than none. I just tried the baking soda on the top of my gas stove which had not only the brown spots, but the burnt on black spots. I tried everything to clean it including SOS pads, powdered cleanser, and other products, but nothing worked. That is until now. I am absolutely amazed! The baking soda cleaned it up and looks like new. I must admit, since the black spots were burnt on, I had to use a toothbrush and plenty of elbow grease to get it off, but it got it off. Thank you so much for this solution. 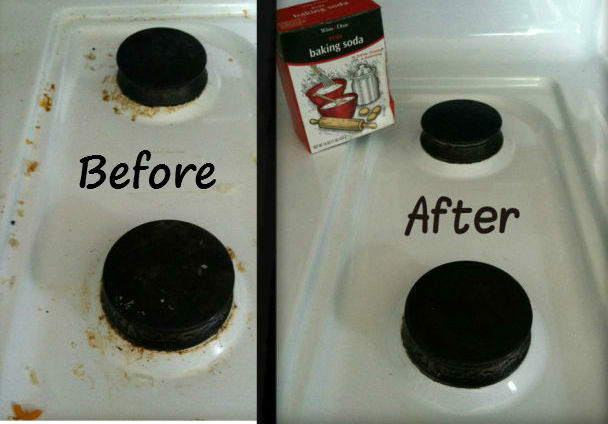 Yes, baking soda and vinegar will clean about anything! There a few things I found it struggles to clean like mold that is caulking in a bathroom but otherwise it will do the trick. If you are looking for other great natural cleaning ideas I recommend you check out this DIY cleaning website. It's great that you we're able to make those yourself. Personally I just buy my cleaning supplies in Calgary. If you are looking for the high quality cleaning products then you must visit Cleaningsupplies4u.com.